Celebrate Valentine’s Day with this sweetheart of a dog. The littlest preschoolers may need help with the pipe cleaners and affixing the heart “head,” but remember: Enjoy the process! 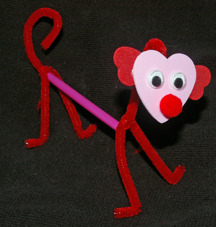 What You Need: 1 straw; 2 red pipe cleaners; 1 large pink foam heart; 2 small red foam hearts; red pom pom; 2 googly eyes; glue (foam glue works best); scissors; cellophane tape. How to Make It: Glue small red hearts overlapping behind large pink heart so it looks like dog ears and a head. Glue pom pom nose and 2 googly eyes. Set aside to dry. Cut straw (adult job) however long you’d like your dog’s body to be (ours is 6 inches). Insert one pipe cleaner through the straw and curl one end for a tail and bend the other end up and then forward for the dog’s neck and head. Cut second pipe cleaner in half (adult job) and twist each over the first pipe cleaner and bend at ends to form feet. Use tape to affix head to pipe cleaner. This entry was posted on Sunday, February 10th, 2008 at 12:21 am	and is filed under animal crafts, foam crafts, pipe cleaner crafts, Valentine and heart crafts. You can follow any responses to this entry through the RSS 2.0 feed. Responses are currently closed, but you can trackback from your own site.